Vacations, by definition, are not typically meant to involve wake-up calls and alarm clocks. But when the jarring buzz knocked me out of a sound sleep just after 5am, I hopped out of bed with little hesitation. 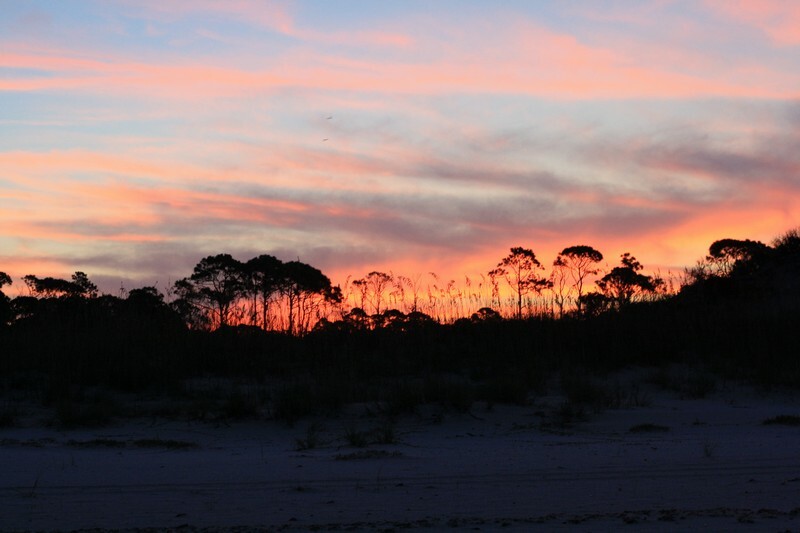 The sun was still hours from being up, but it was busy along the beaches of lesser-known Gulf Coast County, Florida. The St. Joseph Peninsula Turtle Patrol was getting ready to hit the sand. Time is of the essence on these early mornings. 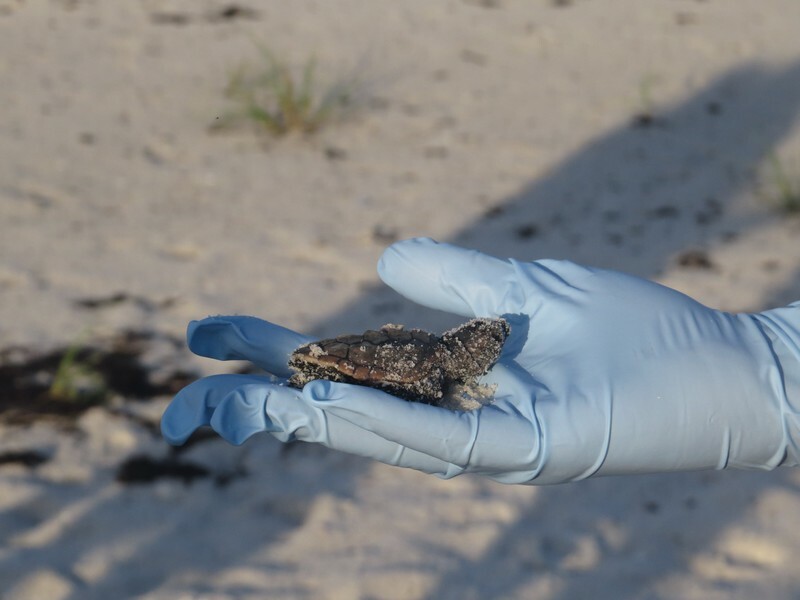 Whether it’s spotting a freshly dug nest or checking on one about to hatch, volunteers’ best chance of catching sight of any clues left in the sand comes with day’s first light. Changing tides, moving rain storms and inevitable footprints quickly cover turtle tracks. Seven days a week, volunteers walk miles of sand searching for answers. 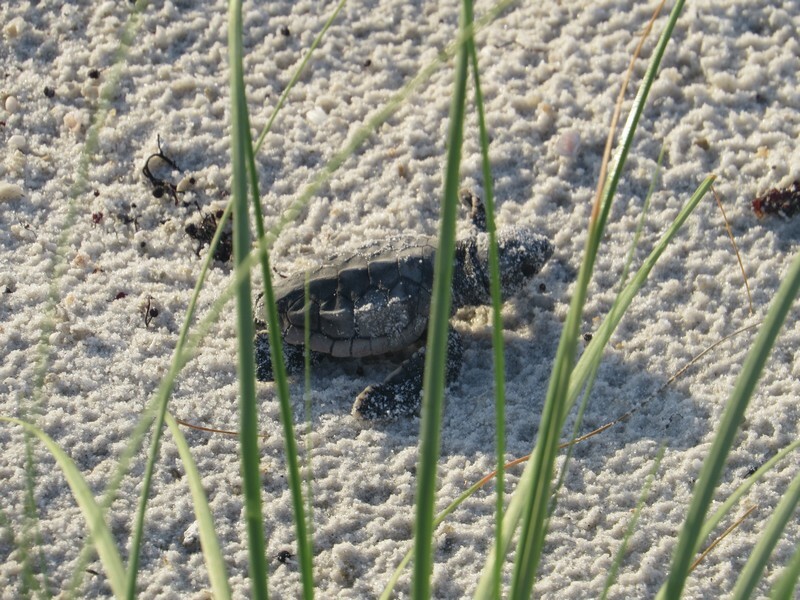 Every summer, loggerhead sea turtles crawl ashore and across the beach toward the dunes to lay their eggs. Under the cover of darkness, female sea turtles dig their nest, lay 100-plus ping pong-sized eggs and camouflage their speedy work before disappearing into the Gulf of Mexico. The combination of dark sand dunes with reflection of the moon and stars off the water guide their night’s work. Mother Nature has a big say in what happens next; to coyotes and sand crabs, turtle eggs make for a tasty snack. But as folks flock to the coast, it’s what we do during our time on the sand that can have the biggest impact on this endangered species. In a perfect world, according to Volunteer Coordinator Jessica McKenzie, there would be close to 300 nests to monitor. This season, they have 141. 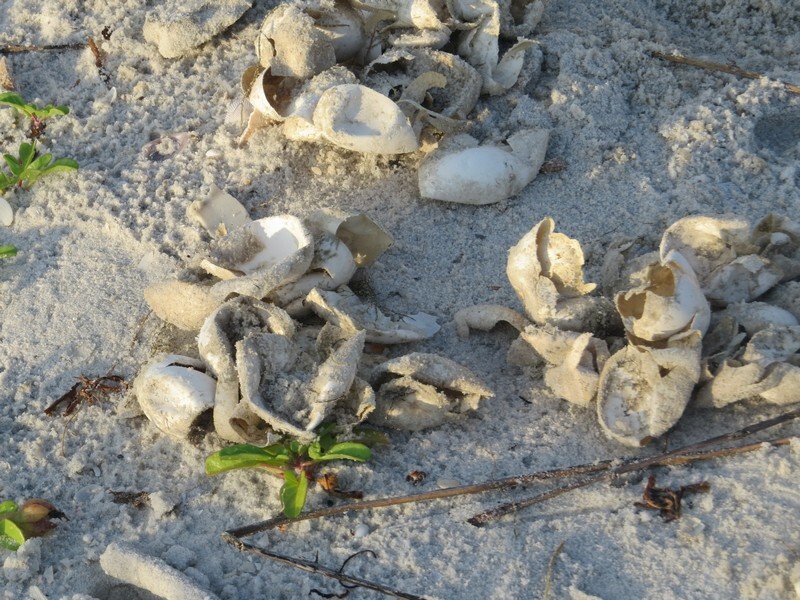 Even if each nest has more than 100 eggs, hatchlings’ odds of survival are not encouraging. It takes an estimated ten-thousand eggs to produce one thriving sea turtle. When a nest is discovered, volunteers construct a turtle campsite. A square of metal mesh is placed over the nest. Each corner is secured with long pieces of wood that, once wrapped with bright yellow caution tape, serve as open-air beach barrier. If walls can talk, these make their point loud and clear. Give us our space in the sand. Think of it as rental of sorts for the 50 or so days it takes eggs to hatch and emerge. 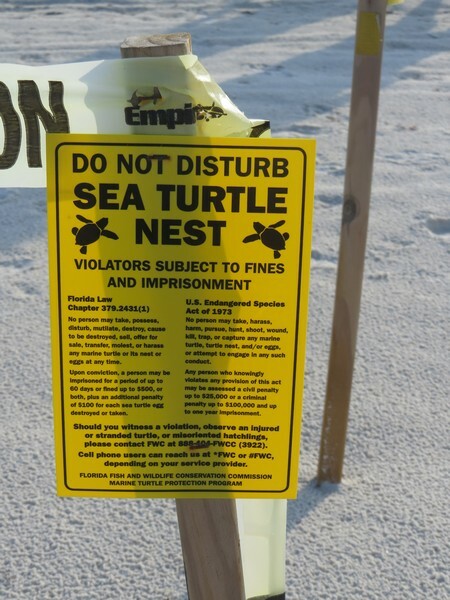 At the very least, for close to two months, the Turtle Patrol will walk by every nest once a day. But even when you’ve got miles to cover, it’s hard to just walk by. “We have our superstitious tricks to get the nests to hatch,” said volunteer Penny Easton. As she and McKenzie walked the beach this Saturday morning, they picked up the occasional stray feather, poking them in the sand near nests yet to hatch. Akin to hanging a horseshoe overhead, some of these nests could use a little extra luck. When the 200 to 300 pound females come onto the beach to lay their eggs, the goal is to build their nests near dunes, away from high tides that can flood the nests. Their eye site is anything but 20/20. Light from nearby homes and beach bonfires can throw them off course. A pop-up beach shelter that spends the night on the sand can throw turtles off track and lead to nests in less than safe or convenient locations. The multiple eggs in nests don’t miraculously hatch simultaneously, but hatchlings communicate with each other and make the decision when to emerge together. Every now and then, someone can get left behind. So three to five days after a nest shows signs of hatchlings’ mass exodus, gloves go on, the protective campsite comes down and volunteers get down on their hands and knees and start digging. With as little help as possible, found hatchlings are boosted atop the sand and begin their hopefully quick and successful journey to the water. 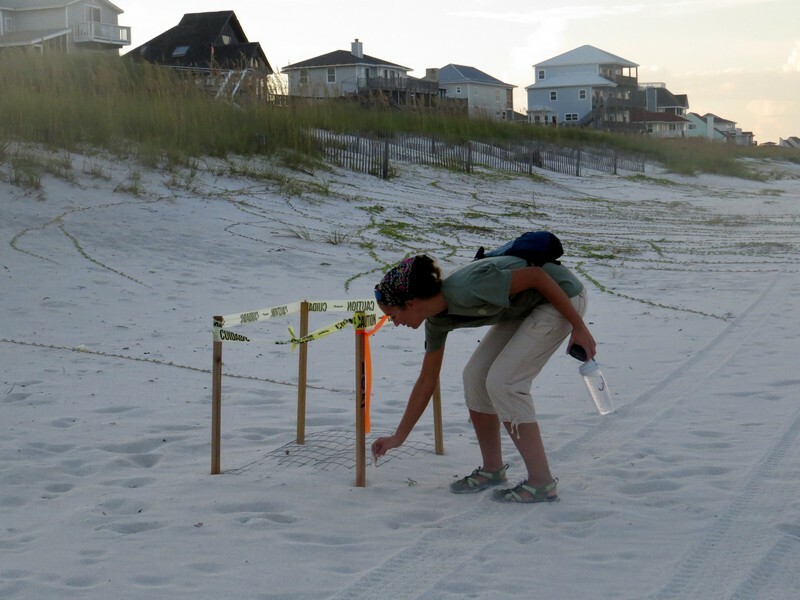 Along with lending the occasional helping hand, excavating nests allows volunteers to track the success of the nests. All egg shells are removed and counted. Nest number 98 brought smiles and cheers. All 101 eggs hatched, with only one stray needing help with the journey to the Gulf of Mexico. After egg shells are re-buried, and the hole filled, paperwork is finalized, caution tape, mesh and wood are collected and carried off the beach. If you didn’t get up before the sun, it appears as if nothing special happened on this small stretch of sand. You don’t have to live in the Sunshine State to accompany the Turtle Patrol. The St. Joseph Peninsula Turtle Patrol is happy to have early morning company of visitors from all around the world. If you’re in town during nesting season, typically May through October, send an email and do some good while you get some vacation exercise. You may go home a little tired, but naps are the best way to kill time on airplanes.